Thermodynamics mainly tells us what we cannot do. Then, it is up to people to decide how not to do what they cannot do, and that leaves a lot of leeway. UGO I really respect your work and excellent posts and I welcome your critiques of the Hills Group. I have reviewed their work and have numerous personal email contacts with B Hill as well. He agrees there might be valid criticisms of their methodology such as the water cut aspect in the various reservoirs. What is not in dispute in my opinion is the falling eroei and diminishing new field discoveries. I covered this in some recent blog posts. I tried to be skeptical but I do think the thermodynamic model has some validity and if the criticism of the model come from non physicists, their criticism may lack validity. Obviously using a detailed life cycle analysis would be the bombproof way to get at the picture but you of all people well versed in systems analysis know how difficult that task would be. If a analyst had access to all financial records and production statistics of a single very large field comparable to the bulk of the very large fields I think that analysis would be useful or even conclusive. The only big US field which might provide that kind of data set might be Alaska if BP would be cooperative. A telling point which I covered is the declining finances of the big three oil companies in the US. Another suggestion that we are nearing the end of the oil economy comes from M KING Hubbert who interestingly enough comes to similar figures of ultimately extractable oil using an entirely different statistical methodology over 50 years ago.. Bradford Hill said new oil extraction could proceed for some time if its extraction is subsidized by another energy source like gas and obviously they were talking about new marginal barrels, not legacy fields. I covered an interesting report from HSBC on the finances of new field discoveries and decline of existing fields published last September. My posts are at www.rendezvousmountainfarm.com. Great work UGO. I have read every post of yours. Yes, the problem is that it is difficult to explain that YES, the EROI of oil is going down and that's causing lots of troubles but NO, the EROI is not yet so low that oil production is a net loss or that it has to be subsidized by means of other energy sources. According to Brandt, the EROI of oil production is around 30 - at least for the fields they examined, others give it in a range of 10-20. Sure, it lower than it used to be in the good old days. But even if it is just 10, that means you have to re-invest ca. 10% of the production into new fields to keep going; that's perfectly possible. Things don't start becoming truly hard until you go down to less than 5. We are not there yet and we won't be there very soon, no matter what Hill and Co. say. The troubles of the oil industry nowadays are caused by the financial system that's imploding. It is because the system is complex and doesn't react linearly to perturbations. And, BTW, thanks for this comment and nice blog, yours. I placed it in my feed. Ugo another timely post which helps to remind readers (and others) that catastrophism has a lot of unsophisticated and erroneous assumptions or methodologies behind the views espoused. A lot of debate about our energy predicament troubles me because their is a lot of opinion spouted but little sensible analysis. The current financial assessments of the oil industry focus on those industries from a perspective of their being simple businesses producing a simple product which they are not. Financial assessments or so called economic assessments are also using tools based on flawed equilibrium theories and neoclassical economic theory and while it is the dominant western world view of technocrats and financial institutions across the globe that does not mean it is a whole or scientific valid world view, how many times to so called forecasters (Central Banks included) get it completely wrong or are simply suffering from inbuilt optimistic bias in the models? A lot. The debates that follow are political not scientific. I have a problem with EROI as far as using financial or account data because the costs or financial issues may not have anything to do with the costs of production per se, after all, equipment does not wear out or need to be replaced all that often but rather the dubious accounting of costs and the manipulation of profit reports combined with the normal practise these days of business of hiding true profits, offshoring profits, price transfers and share buyback schemes all which may create a picture of distress but are more related to neoliberal economic theorems and dodgy accounting practices world wide. The simple model that still works is demand and supply, so we know what demand is or can be and we know what supply is or can be but there are a significant number of factors that can impact on this simple measure. We know that the key problem is price, namely there is a price level at which the resource will not be bought or used because it is too expensive for the buyers or they reduce demand, this is the history of all three oil shocks, 1973, 1990 and 2008. The key problem is reserves and quantifying them because oil is a finite resource. Now one of the distopian views about arises from the economic notion of substitution but we know excepting for a few small areas there is no viable suitable substitute for liquid hydrocarbons and not just for transport, think petrochemicals etc. That is our dilemna each year that goes buy the available reserves decrease and previously unviable reserves are exploited but they remain unprofitable within the confines of the current monetary and financial systems where reserves are not based on a finite resource but can be created indefinitely as long as people accept the money created. The only activity that human beings engage in that does not obey the laws of nature or physics is banking and money at a sovereign level. So I agree it will be the implosion of our social and economic systems that will wreak havoc, political and social, not diminishing oil supplies. I guess my views still reference the 'Limits to Growth' that shows us clearly that it is a multi-faceted system dynamics problem in a finite singular planet. Unless we can come to grips with thinking and implementing political systems based on equity and access with common good in mind we are heading into a long tunnel of violent turmoil, this is the catastrophe, that is when we find out that Malthus, Marx and Keynes were all right all along. Fancy equations borrowed from the laws of theromdynamics will not tell you anything, a simple exponential function is all that is required with respect to supply and demand, that should give us what the Limits to growth team gave us, a multitude of curves for different things crossing over at different times. I agree with the difficulty of explaining ‘exergy’ which is the concept I think figures in this discussion. Can we ask a question in the meantime: what is it that makes profit-seeking outfits walk away from an extractable resource, particularly a fuel source? For the USA (net importer of crude oil since well before the 1973 peak in domestic production), we see some of the answer below. (I guess there might be a useful subsidiary discussion on the role of ‘stripper wells’ in the USA.) We have seen a recent return to expansion in USA crude oil production since 2010 reaching a recent peak followed by a downturn. Art Berman on the beginning of the end of the Bakken Shale play. Oil production must move on all the time to new wells and new plays to provide or increase the daily net supply. At some time in different places this will mean a ‘net-retreat’ from oil production across a country or region. This has been an ongoing story as oil has peaked. The Hill group seems to have claimed a truism based on poorer well performance. However, we can look to recently expanding Iraq, Iran and Russia as well as the enigma of Saudi Arabia as evidence for continuing fungible global oil supply. Having declined for decades US oil increased very significantly from 2010 to peak in April 2015. Since then production shrank by 1.02 million barrels per day to September 2016 and then started to rise again by 0.42mbpd to date. The EIA forecast US production to continue this latest increase to exceed a total of 10mbpd by December 2018, thus restoring more than the production lost since 2015. This will still leave the USA a large net importer of crude oil. I guess we shall see. I'm impressed by the intelligence of the discussion in this thread, but my concern is that it seems to have detached itself from the purpose of having it in the first place. It seems so often the preoccupation of men (plus dear Gail Tverberg) to try to guess the shape of the decline or collapse of fossil fuel production, and when exactly the ripples will hit us in the developed world, with those who disapprove of "catastrophism" just thinking the date is further in the future than others. But really we're all just trying to guess the weight of a cow at the county fair unless we keep this discussion in the broader context of overshoot, since peak oil (and declining EROI) is just one symptom of a larger systemic collapse that's already in progress. The coral reefs are dying, 90% of sperm in a typical male are now malformed or otherwise non-viable, the great methane release has begun all over the world - how does peak oil fit in that contest? Whenever it arrives - 2020 or 2050 or 2005 (if it's already happening) it apparently will be too late to stop the industrial machine that artificially supports an unsustainable population of 7 billion people and paradoxically threatens our extinction. Is there a way to return or direct this discussion back to the larger context, so it can support public policy)(or revolution) that might save our children and descendants? BTW, for the record, the cow weighs 2,143 pounds and 9 ounces. 1. Will oil prices move up or down as EROI falls? 2. Since money is just a marker for energy, how much resource can be converted to reserve long term at a positive energy balance? Sadly, while the IMF, IEA and World Bank have millions to spend on analysis using money (and not energy) it seems left to a handful of unfunded academics and enthusiasts (like the Hill Group) to try to push humanities understanding of biophysical economics forward. I think they made a good attempt with the view of the system they have. I would encourage inviting the Hill Group into friendly discussion. Ugo, I appreciate you keeping Cassandra's Legacy going so there is some place for these kinds of posts. This is where I especially miss The Oil Drum. 1. Search with google for „Moran, Shapiro, pdf“. 2. Load the book (2006 version) you probably find. 4. Go to formula 6.39 and understand. This formula is a simpler form of 6.37 for systems with mass in = mass out. 5. Look at example 6.6, the steam turbine. The steam turbine is a system with mass in = mass out. 7. Understand the Steam turbine, using enthalpy H=U+pV and the ideal gas law. 8. Application of 6.39 to the steam turbine allows to calculate the heat flow out of the turbine for a known work the turbine delivers. 9. The PPS is a system with mass in = mass out. 10. Understand: The heat inflow from oil and water mass currents is equal to the heat flow out of the PPS. 11. Use 6.39 to calculate the work required for the known heat flow out of the PPS. 12. Understand: the work required is the same as ETP. 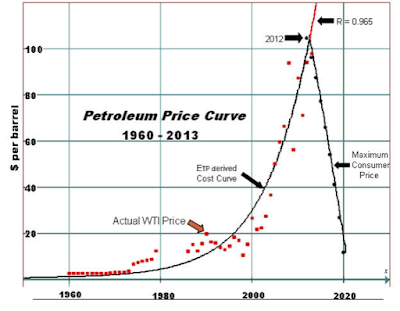 If you still not believe it: follow the oil price.